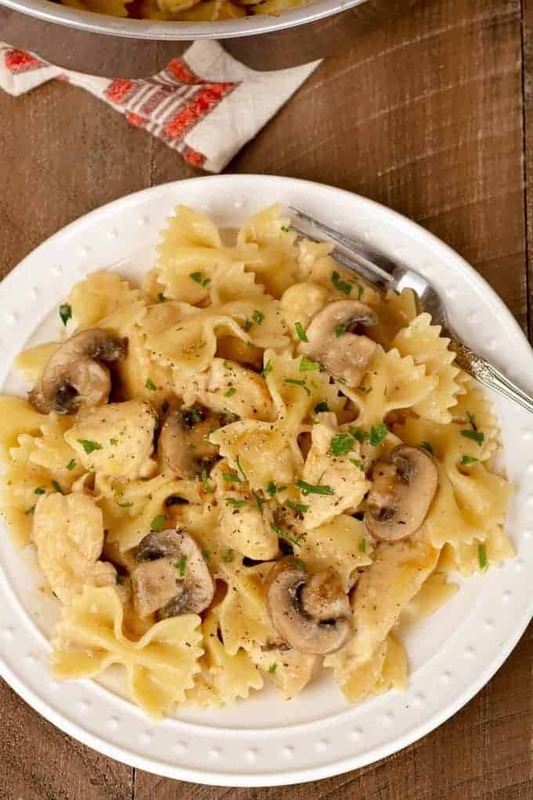 This recipe for Farfalle with Chicken and Mushrooms is easy comfort food at its best. 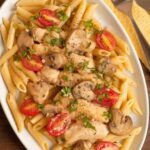 Made with boneless chicken breasts, mushrooms and a light, creamy sherry sauce, it makes a delicious main dish that’s quick and easy enough for weeknights, yet sophisticated enough for a casual company dinner. 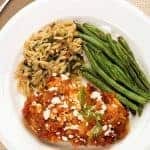 We find boneless chicken breasts to be the perfect choice for easy meals. 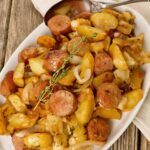 They cook quickly and pair nicely with a seemingly limitless variety of sauces and side dishes. In this dish they’re cut into strips, dredged in seasoned flour and sautéed briefly before deglazing the pan with sherry and adding chicken broth and a small amount of cream. 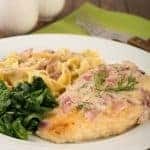 Dredging the chicken in flour thickens added liquids and helps to create a deliciously creamy sauce that doesn’t require a large amount of cream or butter. 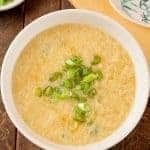 It’s a technique we use in many of our recipes and definitely one that you can put into use to make a wide variety of easy pan sauces. 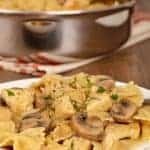 This tasty recipe for Farfalle with Chicken, Mushrooms and Sherry Cream Sauce is simple enough for a weeknight meal, yet elegant enough to serve for company or a Sunday dinner with family. If your chicken breasts have tenderloins attached, remove them and set aside. Place each piece of chicken between 2 sheets of plastic wrap and gently pound to an even thickness of about 1/2-inch. Combine the flour, 1 teaspoon of salt and a few grinds of black pepper in a zip-top plastic bag. 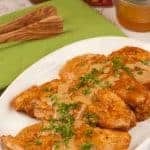 Slice the chicken breasts (and tenderloins) crosswise into 3/4-inch strips, transfer them to the bag and shake until coated with the seasoned flour. Set aside. Heat 2 tablespoons of olive oil in a large frying pan over medium heat. Add the onion and sauté until softened, 2 to 3 minutes. Add the mushrooms and minced garlic and continue cooking until the mushrooms are lightly browned, 4 to 6 minutes longer. Season to taste with salt and pepper, then transfer to a bowl and set aside. While the onions and mushrooms are sautéing, cook and drain the pasta according to package directions. Return the pasta to the pot, drizzle with a little olive oil and set aside. Return the pan you cooked the mushrooms in to the stove over medium-high heat and add 2 more tablespoons of oil. Add the chicken strips, a few at a time, shaking off any excess flour first. Cook the chicken, turning often, until the strips are barely golden on the outside, 2 to 3 minutes total. Deglaze the pan with the sherry, scraping up any browned bits that may have accumulated on the bottom of the pan. Stir in the chicken broth and bring the mixture to a simmer. 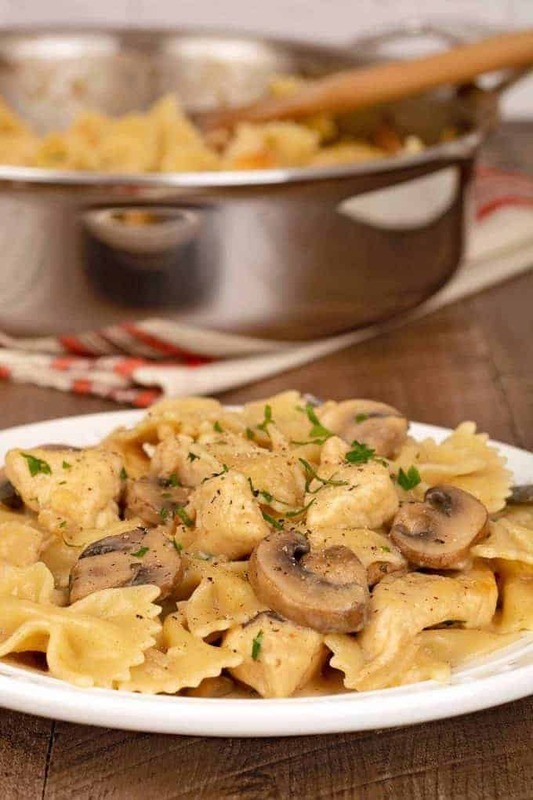 Cook until the sauce begins to thicken, 2 to 3 minutes, then return the mushroom mixture to the pan and combine. 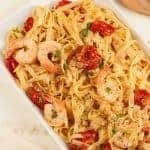 Stir in the cream and parsley, cook for an additional minute, combine with the pasta and serve immediately.